Available in on-screen reading friendly (PDF) and printer-friendly, downloadable (PDF) versions. For more booklets, visit our Booklets for People in Interfaith Relationships page. The secret to raising children who are proud and positive about their Jewish identity is having parents who are engaged and connected to the Jewish community with a fund of Jewish knowledge. For those with younger children, every task is a new one to be mastered and made a comfortable part of their repertoire. InterfaithFamily.com is proud to offer Goodnight, Sleep Tight. 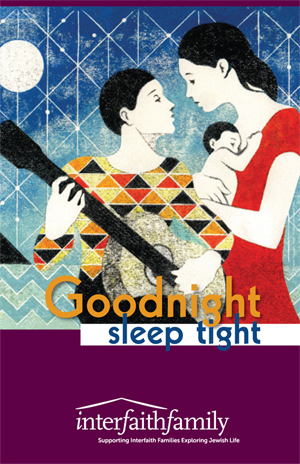 This colorful booklet will encourage parents to make bedtime a Jewish time. It supplies strategies and resources that make bedtime a sweet time now and a precious memory that supports a Jewish future. It can be a bedside resource for interfaith parents and Jewish parents looking for help making a customized ritual for their child. Rituals give a comforting shape to a child’s day. They offer a child a sense of stability and security that provide a gentle transition to sleep. The regularity of brushing teeth, reading a story or singing a song before being kissed goodnight suggests to children that what they know and love is a constant and will be there again in the morning. Adding a prayer at bedtime adds one more sweet element to the end of day ritual. It becomes another step in the letting go of day and activities, of color and light, of a parent’s touch. Repeating these steps each night gives both parent and child a way to end the day peacefully. As their children get older, many parents—whether intermarried, in-married or single—want their children to think about God at the end of the day, to think about being grateful for the day they have had, and to think about what went well and what they might have done better. These are values central to many religions. Saying the Shema, the most well known Jewish prayer, at bedtime, can be a prelude to these conversations. And by adding a Jewish flavor to the end of the day, whether by prayer, story or song, parents give color and shape to children’s view of themselves and their world. Many of the writers for InterfaithFamily.com have pointed out that strong home rituals lead to a stronger Jewish identity, making their interfaith families more comfortable with attending synagogue and other Jewish events and celebrations. Please think about giving this booklet a try! The booklet can also be shared with all the new parents in your community, to those who come to tot Shabbat and those who attend preschool programs. Grandparents will also enjoy creating a nighttime ritual for sleepovers and may even want to share the booklet with their children who live far away.